What's up with the 2017 Chicago Architecture Biennial? 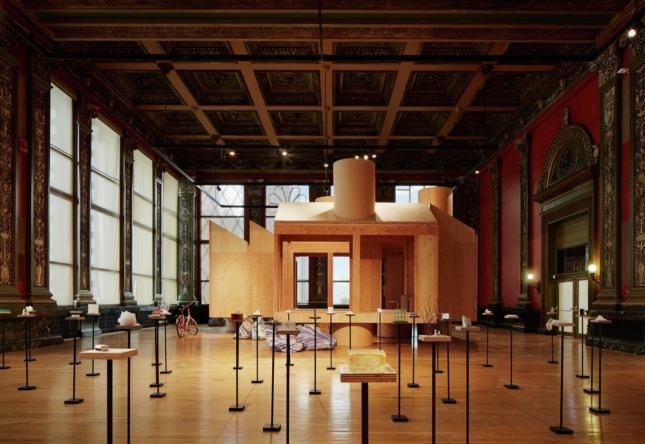 - Archpaper.com What's up with the 2017 Chicago Architecture Biennial? The 2017 Chicago Architecture Biennial (CAB) will open its second iteration this September under the theme “Make New History.” This raises some serious questions. Why are we still talking about “history” in architecture? Didn’t the cheeky use of architectural history doom postmodernism? Early postmodernism’s original, successful use of decorative, historic forms was a radically subversive act in the 1960s, a revolt against the hegemony of Miesian corporate modernism. But isn’t there a new language for today’s context? One could make the argument that history is always present in architecture, even if there isn’t an obvious rampant arch or column. For example, as digital techniques took off in the 1980s and ’90’s, Chuck Hoberman looked to Buckminster Fuller’s geodesic dome for precedent. Isn’t history ironically present even in the most radical ideas? Is referencing “history” a way of going back to the pomo of 1979, or even the Romanesque Revival of the mid-1800s? What do we even mean by “history”? Is there a more underwhelming word in architecture? Do we need another Chicago Tribune Tower competition, which the biennial intends to revisit? Hasn’t the Chicago architecture community—led by Stanley Tigerman (and his late submissions)—done enough of those? It can be argued that the site, context, politics, codes, and people involved in any project leave a mark and, if we look close enough, define and historicize most buildings. How many times can we simplify architectural forms into lower-res versions of themselves until we are at minimalist modernism again? It seems history—rather than a productive starting point for intellectual inquiry—is becoming a flaccid category deployed to showcase the work of friends without thinking too much about the content? Perhaps this would have been an opportunity to consider how architectural history relates to the city and its inhabitants. In other words, what does it mean to be the Chicago Architecture Biennial? Consider the responsibilities of staging a massive architecture exhibition in one of the grandest public interiors in the world. Will summer vacationers Gary and Sheila from Waukesha, Wisconsin, understand—let alone care about—the exhibition? The city’s first architecture biennial introduced a formidable group of Chicago practitioners to the larger architectural community and presented a balanced global perspective to the people of Chicago. Was the 2015 biennial so good because it blended the global and local perfectly? Was it the first biennial’s inimitable leadership—Graham Foundation Director Sarah Herda’s on-the-ground supervision and architect-curator Joseph Grima’s global perspective—that impressed Chicago on the contemporary architecture consciousness? Perhaps what all of this boils down to is: How will “history” operate in this biennial? This could be an opportune moment in which history could connect the biennial to issues outside of architecture, or speculate on new ways architecture could be relevant in the world. It could help point to the future and imagine how technology, the environment, migration, and other nascent geopolitical forces will rearrange the world. Or will we fall asleep listening to yet another reflection on Rosalind Krauss and John Baldessari? So, what is the reason for this return to something that we never really lost? And how will this about-face to “history” be different than past discursive turns? There are certainly new ways of making and working available in examining history, but is “history” just a disciplinary co-opt of a broader, more relevant phenomenon endemic in our cut-and-paste culture and the information age? History in this year’s Chicago biennial seems to be used as an empty signifier that denotes taste and style, like the art we might see at EXPO Chicago, which—not coincidentally—will run in parallel to CAB. The curators say they are interested in “the axis between architecture and art.” But if we really want to talk about art and architecture, why not look at contemporary art and how it combines disciplinary knowledge with relevant issues—and how it seems to be having better luck than architecture operating in a market that it is completely dependent on?